My friend Louis (lover of SNAKES!!) wants to know the story behind this photograph. Okay Louis, this is just for you, crazy person that you are. Certainly I’m not tempted to look inside. After all, the second message was written just three days before our arrival by someone a lot more curious than I am about deadly snakes. The mamba is most likely still in there. Who wants to reconfirm a reconfirmation? Mambas are territorial; they will always return to their lairs, although that’s usually in an abandoned termite mounds or a hollow tree, rarely, I’d bet extremely rarely, in a toilet. A mamba is diurnal, active both night and day. It could be sleeping in there. Or not. The view from the platform is marvelous. 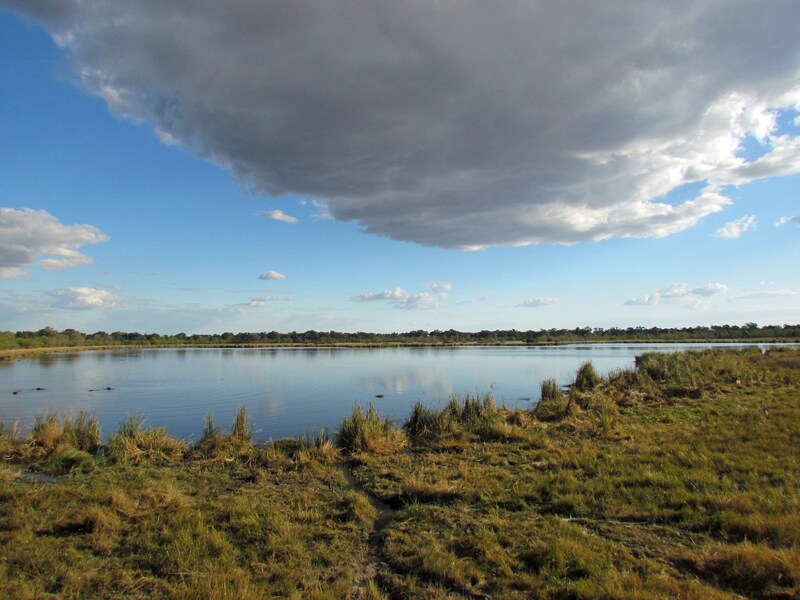 A massive cloud hangs over the hippo pool and puffs of other clouds reflect in the tranquil water. A dozen hippos rise and sink, burbling like submerged tubas. Tracks in the grass are hippo paths, where the hippos come out of the pool at night to feed, foraging as far as three miles for sweet young shoots. On the far side of the river, specks in the distance, a huge herd of elephants splashes along the edge of a reed bed. 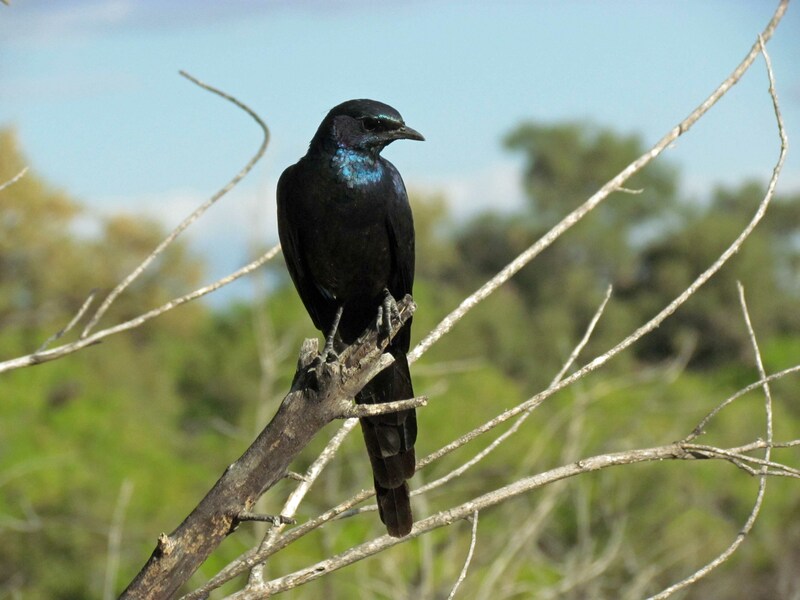 After I check for mambas, I lean on the rail of the platform to steady my camera. I use the digital zoom to take a picture, but it’s an extremely low-pixelated shot. 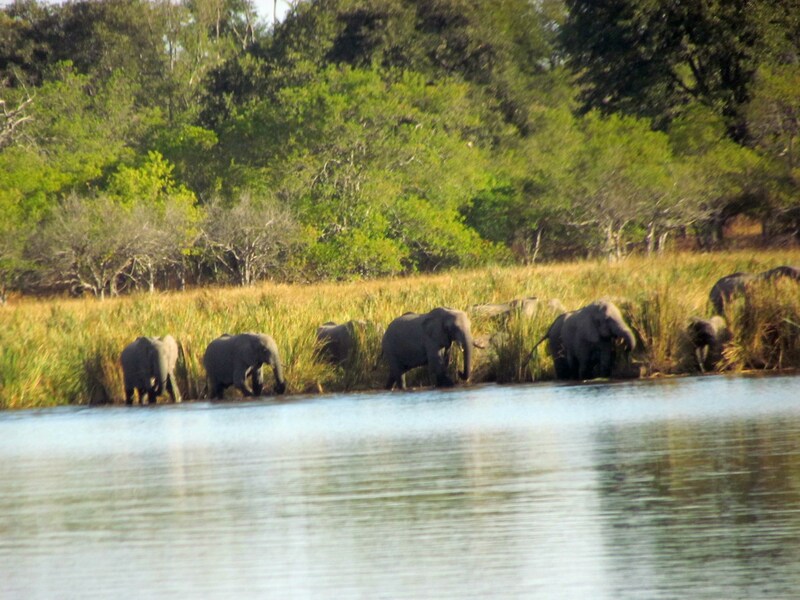 The elephants are in constant motion, appearing and disappearing in the reeds, so the photo turns out fairly blurry, but at least I have proof that those specks were really elephants. So, Louis, the viewing platform has its own GPS coordinates. If YOU want to look at that mamba and reconfirm one more time that it’s really there, I can tell you exactly where to go! Wow! Scary! I would be glad to take their word for it. Yes, fear is sometimes manifested in what you DON’T see. I love your description of this search for the Black Mamba. Good of the last visitor to the long drop to leave a warning. My husband loves snakes too. In fact, his main reason for leaving the UK for Africa was to have access to more of them. We (or rather I,) have had many a scary moment while he pursues them. There must be a lot of readers out there like your husband. It’s the most popular post on my blog. The part I liked was that someone (like your husband) RECONFIRMED the snake was still in there. Thank heavens for handy bushes. Wow! Scary! I had a friend who was staying in Thailand, and she never went to the outhouse at night, because their was a King Cobra living under the porch that became active at night. You are a great storyteller, Cheryl. Yikes! I don’t want to be anywhere near a black mamba! Thanks for reading it Fergiemoto – this was as close as I’ve ever been to seeing a snake in all the times I’ve been to Africa, and it was too close! Ooh er! I’m extremely happy that black mambas do not occur in my area! They are the only snake I am truly afraid of. Puffy’s and Boomslangs I have great respect and admiration for, even the Rinkhals, which we do have occassionally visiting. I think you are awfully brave to have ventured out of the Landy at all! No, it is YOU who are brave. We have no venomous snakes at all where I live, just garter snakes, happily munching the wee pests of my garden. I grew up with rattlesnakes around, a venomous snake which kindly rattles its tail when disturbed and lets you know exactly where it is. I think, though, if everyone lived with venomous snakes, it would make us all a lot more aware of our surroundings! Thanks for reading my posts! Well Miss Big Time African Adventurer—I really enjoyed this posting finally. I know I have been chomping at your heels about this experience and the details surrounding it. 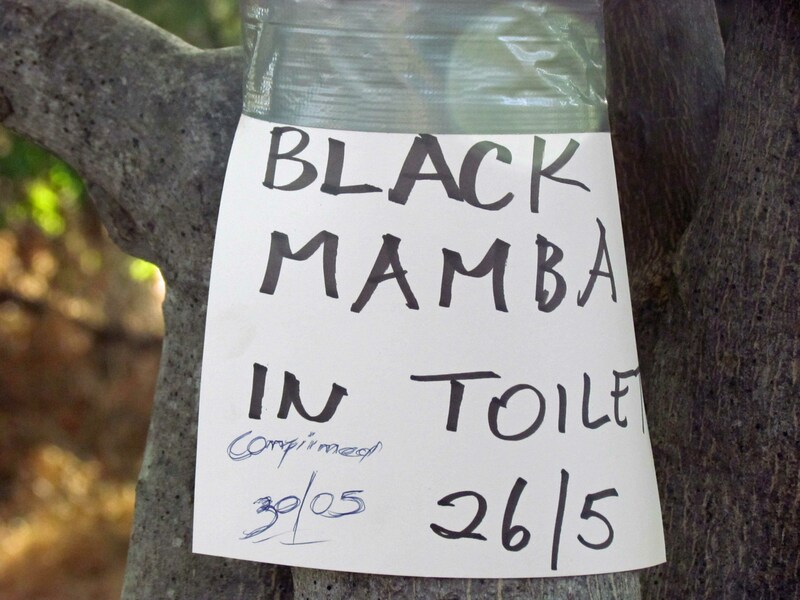 However, I am still quite disappointed in the fact that you did not venture a bit further to explore the possibility of that mamba taking up “residence” in the toilet facility of Doug and Sandi Groves’ Okavango Delta camp. Thanks for providing me with some entertainment today! In your dreams, Louis. I expect YOU to take many snake photos on YOUR next trip to Africa. BTW, the toilet was far, far away from the longdrops at Doug and Sandi’s camp – this “adventure” happened while I was on mobile safari in the Moremi Game Reserve. Glad I provided you with some entertainment. I often affect people that way . . .